Yesterday was a very big day. Three years ago, on the 19th September 2012, I published Last Sunrise. It sold… about 30 copies by January, mostly to friends and family, but I was published. Then came Wanderer’s Escape which was followed by the two Dark Soul books in the spring, and since then it’s been an amazing journey. Not only has the success I’ve had been astounding, I’ve also met some incredible people who’ve offered encouragement, help and pointed out things that weren’t quite right. It still blows me away that people enjoy my writing so much they want to reach out and get in touch. Thank you to everyone who’s done that, and a special thankyou to those who went even further and became beta readers. Last Sunrise went on to sell just 154 copies… but once I made it free it got another 6,837 free downloads, so it’s almost at 7,000 total downloads. That makes me really happy because I love the stories in it. They might not be as polished as my writing is now, but I’m still proud of every one of them. It’s great seeing the reviews, and especially buy doxycycline amazon seeing which stories someone particularly liked. What Does Three Years Look Like? Overall, the numbers are amazing. 21,120 books sold, 141,273 free downloads so 162,368 copies of my books out there. It’s actually higher – Kobo doesn’t report free downloads (via Smashwords) and there are some sites I don’t track the stats for yet (like Noisetrade and Goodreads). Wanderer’s Escape is still by far the most successful book, with just under 120,000 total downloads. It has 519 reviews on Amazon sites alone, of which 398 are five star and 294 are four star. Wanderer – Origins has reached 9,481 sales and Tainted Universe is at 7,277. The two Dark Soul books are slower burners, but they still have over 18,700 downloads & sales between them. I’m really excited for the next year. Wanderer Book Four will be out on October 10th, of course, and another book of short stories should be out somewhere around Christmas time, maybe a bit later. 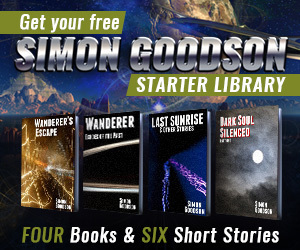 I will be working hard on Wanderer Book Five, and I’m sure I’ll be writing quite a few more short stories too. And there’s… well, that one’s a secret for now. More details at a later date.